A ganglion is a small, usually hard bump above a tendon or in the capsule that encloses a joint. A ganglion is also called a synovial hernia or synovial cyst. 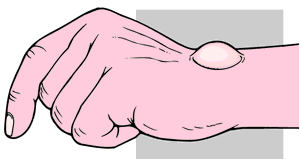 Most ganglions develop on the hand or wrist. This condition is common in people who bowl or who play handball, raquetball, squash, or tennis. Runners and athletes who jump, ski, or play contact sports often develop foot ganglions. Mild sprains or other repeated injuries can irritate and tear the thin membrane covering a tendon, causing fluid to leak into a sac that swells and forms a ganglion. Ganglions are usually painless, but range of motion may be impaired. Flexing or bending the affected area can cause discomfort, as can continuing to perform the activity that caused the condition. Cysts on the surface of the skin usually develop slowly but may result from injury or severe strain. An internal ganglion can cause soreness or a dull, aching sensation, but the mass cannot always be felt. Symptoms sometimes become evident only when the cyst causes pressure on a nerve or outgrows the membrane surrounding it. Diagnosis is usually made through physical examination as well as such imaging studies as x ray, ultrasound, and magnetic resonance imaging (MRI). Fluid may be withdrawn from the cyst and evaluated. Some ganglions disappear without treatment, and some reappear despite treatment. A ganglion is a non-cancerous cyst filled with a thick, jelly-like fluid. Ganglions can develop on or beneath the surface of the skin, most likely on the hand or wrist, although runners and skiers often develop them on the foot. symptoms. Surgery performed in a hospital operating room or an outpatient facility, is the only treatment guaranteed to remove a ganglion. The condition can recur if the entire cyst is not removed. The patient may bathe or shower as usual, but should keep the surgical site dry and covered with a bandage for two or three days after the operation. Patients may resume normal activities as soon as they feel comfortable doing so. Possible complications include excessive post-operative bleeding and infection of the surgical site. Calcification, or hardening, of the ganglion is rare. Exercises that increase muscle strength and flexibility can prevent ganglions. Warming and cooling down before and after workouts may also decrease the rate of developing ganglions. "Foot Ganglion." ThriveOnline. May 25, 1998. http://thriveonline.oxygen.com. "Hand or Wrist Ganglion." ThriveOnline. May 25, 1998. http://thriveonline.oxygen.com. 1. a knot, or knotlike mass; in anatomy, a group of nerve cell bodies, located outside the central nervous system; occasionally applied to certain nuclear groups within the brain or spinal cord, e.g., basal ganglia. aberrant ganglion a small ganglion sometimes found on a dorsal cervical nerve root between the spinal ganglia and the spinal cord. Acrel's ganglion a cystic tumor on an extensor tendon of the wrist. Andersch's ganglion inferior g. (1). autonomic ganglia aggregations of cell bodies of neurons of the autonomic nervous system, divided into the sympathetic and parasympathetic ganglia. basal ganglia see under nucleus. Bidder's ganglia ganglia on the cardiac nerves, situated at the lower end of the atrial septum. Bochdalek's ganglion superior dental plexus. cardiac ganglia ganglia of the cardiac plexus near the arterial ligament. cervicothoracic ganglion one formed by fusion of the inferior cervical and the first thoracic ganglia. cervicouterine ganglion cervical g. (2). Cloquet's ganglion a swelling of the nasopalatine nerve in the anterior palatine canal. dorsal root ganglion spinal g.
Ehrenritter's ganglion superior g. (1). false ganglion an enlargement on a nerve that does not have a true ganglionic structure. ganglion im´par the ganglion commonly found in front of the coccyx, where the sympathetic trunks of the two sides unite. 1. the lower of two ganglia on the glossopharyngeal nerve as it passes through the jugular foramen. 2. a ganglion of the vagus nerve, just below the jugular foramen. Lee's ganglion cervical g. (2). Ludwig's ganglion one near the right atrium of the heart, connected with the cardiac plexus. lumbar ganglia the ganglia on the lumbar part of the sympathetic trunk, usually four or five on either side. Meissner's ganglion one of the small groups of nerve cells in Meissner's plexus. mesenteric ganglion, inferior a sympathetic ganglion near the origin of the inferior mesenteric artery. mesenteric ganglion, superior one or more sympathetic ganglia at the sides of, or just below, the superior mesenteric artery. otic ganglion a parasympathetic ganglion immediately below the foramen ovale; its postganglionic fibers supply the parotid gland. parasympathetic ganglion one of the aggregations of cell bodies of cholinergic neurons of the parasympathetic nervous system; they are located near to or within the wall of the organs being innervated. phrenic ganglion a sympathetic ganglion often found within the phrenic plexus at its junction with the cardiac plexus. pterygopalatine ganglion a parasympathetic ganglion in the pterygopalatine fossa; its preganglionic fibers are derived from the facial nerve via the greater petrosal nerve and the nerve of the pterygopalatine canal and its postganglionic fibers supply the lacrimal, nasal, and palatine glands. 1. a sympathetic ganglion on the heart wall near the superior vena cava. 2. one of the sympathetic ganglia in the diaphragmatic opening for the inferior vena cava. 3. one of the ganglia in the gastric plexus. Ribes' ganglion a small ganglion sometimes seen in the termination of the internal carotid plexus around the anterior communicating artery of the brain. 2. (in the pl.) celiac ganglia. 2. (in the pl.) the ganglia on the roots of the cranial nerves, containing the cell bodies of sensory neurons. 3. both of these considered together. sphenomaxillary ganglion , sphenopalatine ganglion pterygopalatine g.
spinal ganglion one on the posterior root of each spinal nerve, composed of unipolar nerve cell bodies of the sensory neurons of the nerve. Ganglion sensorium nervi spinalis (spinal ganglion), seen in a cross-section of the spinal cord. spiral ganglion the ganglion on the cochlear nerve, located within the modiolus, sending fibers peripherally to the organ of Corti and centrally to the cochlear nuclei of the brain stem. splanchnic ganglion one on the greater splanchnic nerve near the twelfth thoracic vertebra. submandibular ganglion a parasympathetic ganglion located superior to the deep part of the submandibular gland, on the lateral surface of the hyoglossal muscle. 2. a small ganglion on the vagus nerve just as it passes through the jugular foramen. sympathetic ganglion any of the aggregations of cell bodies of adrenergic neurons of the sympathetic nervous system; they are arranged in chainlike fashion on either side of the spinal cord. trigeminal ganglion one on the sensory root of the fifth cranial nerve in a cleft in the dura mater on the anterior surface of the petrous part of the temporal bone, giving off the ophthalmic and maxillary nerves and part of the mandibular nerve. vestibular ganglion the sensory ganglion of the vestibular part of the eighth cranial nerve, located in the upper part of the lateral end of the internal acoustic meatus. 1 a knot or knotlike mass of nervous tissue. 2 one of the nerve cell bodies, chiefly collected in groups outside the central nervous system. Very small groups abound in association with alimentary organs. The two types of ganglia in the body are the sensory ganglia on the dorsal roots of spinal nerves and on the sensory roots of the trigeminal, facial, glossopharyngeal, and vagus nerves and the autonomic ganglia of the sympathetic and parasympathetic systems. 1. [TA] An aggregation of nerve cell bodies located in the peripheral nervous system. 2. 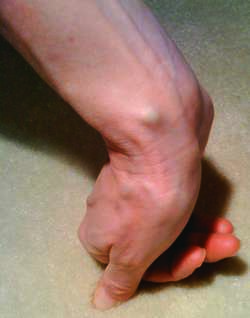 A cyst containing mucopolysaccharide-rich fluid within a fibrous capsule; usually attached to a tendon sheath in the hand, wrist, or foot, or connected with the underlying joint. Synonym(s): myxoid cyst, synovial cyst. 2. A dorsal root ganglion or spinal ganglion. Any autonomic ganglion located in the abdomen. Either of the paired prevertebral autonomic ganglia in the nerve plexus that surrounds the aortic roots of the renal arteries. It receives preganglionic sympathetic axons via the major splanchnic nerves. A collection of postganglionic autonomic neurons in the peripheral nervous system that are surrounded by a loose connective tissue capsule. Dendrites of the neurons can be limited to the neuropil inside the ganglion, or they can pierce the capsule and extend into the surrounding regions. Each preganglionic autonomic axon usually synapses on the dendrites of many ganglionic neurons. During development, the autonomic ganglia are derived from the neural crest. Large central nervous system nuclei lying deep in the cerebral hemispheres below the cortex. The core nuclei that compose the basal ganglia include the caudate nucleus and putamen (together, called the striatum), the globus pallidus (the pallidum), and the amygdaloid complex. The putamen and globus pallidus are adjacent and are sometimes grouped together as the lentiform nucleus. Other nearby nuclei are key controllers and modulators of the basal ganglia; these include the substantia nigra, the ventral tegmental area, and the subthalamic nucleus. The basal ganglia, which are central players in the extrapyramidal motor system, are involved in initiating motor programs, and diseases of the basal ganglia, eg, tremor, athetosis, hemiballismus, chorea, and Parkinsonism, are associated with movement problems. Collections of autonomic (mainly postganglionic parasympathetic) neurons clumped in the superficial and deep cardiac plexuses. These plexuses are a meshwork of visceral afferent, sympathetic, and parasympathetic axons that coat the lower part of the trachea, its bifurcation, the aorta, the pulmonary trunk, and the coronary arteries. A ganglion formed by filamentous threads from the carotid plexus beneath the carotid artery. Either of a pair of interconnected prevertebral autonomic ganglia in the celiac plexus, a meshwork of autonomic axons that wrap around the celiac trunk and the root of the superior mesenteric artery. The celiac ganglia are the largest of the prevertebral ganglia and receive preganglionic sympathetic axons via the major splanchnic nerves. Any of the parasympathetic ganglia (otic, pterygopalatine, and submandibular) in the head. Any of the three pairs of ganglia (superior, middle, inferior) in the cervical portion of the sympathetic trunk. A small autonomic ganglion lying on the outside of the optic nerve in the rear portion of the orbit. This ganglion receives preganglionic parasympathetic axons from the midbrain via the oculomotor nerve (CN III). It sends postganglionic parasympathetic axons into the eye, via the short ciliary axons, to innervate the ciliary muscle, the sphincter of the iris, the smooth muscles of local blood vessels, and the cornea. A ganglion located in the coccygeal plexus and forming the lower termination of the two sympathetic trunks; sometimes absent. Any of several ganglia of the sympathetic nervous system. They are in the mesenteric nervous plexuses near the abdominal aorta and include the celiac and mesenteric ganglia. An enlargement on a nerve that does not contain a ganglion. The sensory ganglion of the facial nerve (CN VII). The ganglion lies inside a bend in the facial canal (at the geniculum of the facial nerve) where the preganglionic parasympathetic axons leave the facial nerve and form the greater petrosal nerve. The geniculate ganglion contains the cell bodies of the bipolar neurons that receive taste information from the palate and the anterior two-thirds of the tongue via the chorda tympani. The axons of the neurons of the ganglion run in the nervus intermedius component of the facial nerve and synapse in the nucleus of the fasciculus solitarius. The lowest (most caudal) of the cervical ganglia. It is adjacent to vertebra C7 or T1. Postganglionic sympathetic axons from the inferior cervical ganglion join spinal nerves C7–T1 and the pulmonary nerves. A prevertebral sympathetic ganglion located in the inferior mesenteric plexus, a meshwork of autonomic axons on and near the origin of the inferior mesenteric artery. The smaller of the two sensory ganglia of the vagus nerve (CN X). The jugular ganglion lies in the jugular foramen of the skull. Neurons in the ganglion send somatic sensory fibers to the dura of the posterior cranial fossa, the skin behind the ear, and the skin along the inferior portion of the tympanic membrane and the adjacent floor of the external auditory canal; the axons of these neurons follow the vagus nerve into the brainstem where they join the spinal trigeminal tract. Any of a chain of ganglia forming the main sympathetic trunk. Any of the three or four pairs of paravertebral ganglia in the lumbar section of the sympathetic trunk. The lumbar ganglia send postganglionic sympathetic axons, via lumbar splanchnic nerves, to the superior hypogastric plexus; from there the axons are distributed to the pelvic viscera. The central and smallest of the cervical ganglia. It is adjacent to vertebra C6. Approximately 40% of people lack this ganglion. In some people, it merges with the superior cervical ganglion, forming one elongated ganglion. Postganglionic sympathetic axons from the middle cervical ganglion join cervical nerves C5–C6. The larger of the two sensory ganglia of the vagus nerve; it is located in the nerve below the jugular foramen. The ganglion contains a mix of somatic and visceral sensory neurons; somatic neurons send their axons into the spinal trigeminal tract in the brainstem; visceral neurons send their axons into the fasciculus solitarius. A small autonomic ganglion located deep in the zygomatic fossa immediately below the foramen ovale. It receives preganglionic parasympathetic axons from the inferior salivatory nucleus via the glossopharyngeal nerve (CN IX); it sends postganglionic parasympathetic axons to innervate the parotid gland. An autonomic ganglion containing postganglionic parasympathetic neurons. Any of the pairs of sympathetic ganglia lying on either side of the vertebral column and forming the thickened nodes of the sympathetic trunk. The usual complement of paravertebral ganglia includes 2-3 cervical, 11-12 thoracic, 3-4 lumbar, and 4-5 sacral ganglia. A ganglion in the peripheral nervous system. The larger of the two sensory ganglia in the glossopharyngeal nerve (IX). The ganglion lies on the outer surface of the base of the skull in a groove in the petrous portion of the temporal bone just outside the jugular foramen. The petrosal ganglion contains cell bodies of unipolar neurons that receive taste and tactile sensation from the posterior third of the tongue and the oropharynx. Axons of these neurons follow the glossopharyngeal nerve into the hindbrain. A ganglion in contact with the glossopharyngeal nerve. Any of a group of ganglia joining the phrenic plexus. An irregular and sometimes fragmented sympathetic ganglia in one of the nerve plexuses along the abdominal aorta or its major branches. The major prevertebral ganglia (the celiac, aorticorenal, phrenic, and superior and inferior mesenteric ganglia) are interconnected by autonomic nerves. Any of a group of ganglia joining the renal plexus. Any of the four small ganglia located in the sacral portion of the sympathetic trunk that lie on the anterior surface of the sacrum and are connected to the spinal nerves by gray rami. Any ganglion (e.g., trigeminal ganglion or dorsal root ganglion) containing neurons that receive afferent (sensory) signals. An autonomic ganglion found in the pterygopalatine fossa. It receives preganglionic axons from the superior salivatory nucleus via the facial nerve (CN VII). It sends postganglionic parasympathetic axons to innervate the lacrimal glands and the blood vessels and glands of the mucosa of the nose and palate. A chain of tiny sensory ganglia that winds through the cochlea of the inner ear. These ganglia contain the cell bodies of the neurons that receive auditory signals from the organ of Corti. The axons of these neurons form the cochlear component of the vestibulocochlear nerve and synapse in the cochlear nuclei in the brainstem. An autonomic ganglion suspended from the lingual nerve between the mylohyoid and hyoglossus muscles. It receives preganglionic parasympathetic axons from the superior salivatory nucleus via the facial nerve (CN VII). It sends postganglionic parasympathetic axons to innervate the submandibular and sublingual salivary glands and the mucosa of the floor of the mouth. The uppermost cervical ganglion and the largest paravertebral autonomic ganglion. It is adjacent to vertebra C2 or C3. It sends postganglionic sympathetic axons into cranial nerves CN VIII–XII, cervical nerves C1–C4, and the pharyngeal, carotid, and cardiac nerves. Either of the paired prevertebral autonomic sympathetic ganglia in the lower celiac plexus and adjacent to the superior mesenteric artery. It receives preganglionic sympathetic axons via the major splanchnic nerves. A ganglion situated in the suprarenal plexus. Any of the paravertebral or prevertebral autonomic ganglia that are innervated by preganglionic axons from the intermediolateral column of neurons in spinal cord segments T1–L2. A tiny ganglion joining the anterior branches of the superior cervical ganglion. A ganglion of the autonomic division of the nervous system that lies close to or within the organ innervated. Any of 11 or 12 pairs of paravertebral ganglia in the thoracic section the sympathetic trunk. The first four or five thoracic ganglia send postganglionic sympathetic axons to the cardiac nerves. Three major splanchnic nerves (the greater, lesser, and least splanchnic nerves) appear to emerge from the thoracic ganglia. They then run through the diaphragm and end in the celiac, mesenteric, and aorticorenal prevertebral ganglia. These nerves are actually bundles of preganglionic sympathetic axons that originate in the spinal cord and pass through the thoracic paravertebral ganglia without synapsing on their way to synapse in the abdominal prevertebral ganglia. An enlargement on the tympanic portion of the glossopharyngeal nerve. A two-part ganglion in the vestibular branches of the vestibulocochlear nerve (CN VIII) inside the internal auditory meatus. The ganglion contains the cell bodies of bipolar neurons that receive equillibrium information from the membranous labyrinth of the semicircular canals in the inner ear. The axons of these neurons form the vestibular component of the vestibulocochlear nerve and synapse in the vestibular nuclei in the brainstem. 1. Any large, discrete collection of nerve cell bodies, from which bundles of nerve fibres emerge. 2. A rubbery, compressible, cystic swelling arising from the fibrous sheath of a tendon or the capsule of a joint, commonly on or around the wrist. (pl. ganglia) a structure composed of the CELL BODIES of neurones that in vertebrates is usually found outside the central nervous system (CNS), but which may form part of the CNS in invertebrates where such structures are usually well-developed in the head region. In vertebrates, ganglia are found in the PERIPHERAL nervous system and the AUTONOMIC NERVOUS SYSTEM. (1) in anatomy: a small mass of nerve cells, outside the central nervous system, where synaptic connections relay afferent or efferent nerve impulses. ganglia pl . dorsal root ganglia contain the cell bodies of sensory neurons, providing relay into the spinal cord, and there are equivalent afferent relays to the brain stem for sensory components of cranial nerves. autonomic ganglia provide efferent relay from nerve fibres from the central nervous system to the sympathetic and parasympathetic neurons that innervate relevant tissues throughout the body; (2) in pathology: a fluid-filled fibrous tissue sac that develops on a tendon sheath, especially around the wrist. A ganglion is usually painless but they can increase in size to become tender, unsightly or large enough to restrict movement; treatment is not usually required but they can be surgically removed if troublesome. An aggregation of nerve cell bodies found in numerous locations in the peripheral nervous system. Plural: ganglia. ganglion cell See ganglion cell. ciliary ganglion A small reddish-grey body about the size of a pinhead situated at the posterior part of the orbit about 1 cm from the optic foramen between the optic nerve and the lateral rectus muscle. It receives posteriorly three roots: (1) the long, nasociliary or sensory root (or ramus communicans), which contains sensory fibres from the cornea, iris and ciliary body and some sympathetic postganglionic axons going to the dilator muscle; (2) the short (or motor root or oculomotor root) which comes from the Edinger-Westphal nucleus through the third nerve (oculomotor). It carries fibres supplying the sphincter pupillae and ciliary muscles; (3) the sympathetic root, which comes from the cavernous and the internal carotid plexuses. It carries fibres mediating constriction of the blood vessels of the eye and possibly mediating dilatation of the pupil. The ciliary ganglion gives rise to 6-10 short ciliary nerves. Syn. lenticular ganglion; ophthalmic ganglion. See pupil light reflex. gasserian ganglion Sensory ganglion of the fifth nerve located in a bony fossa on the front of the apex of the petrous temporal bone. It receives the sensory portion of the fifth nerve (trigeminal) in the posterior part of the ganglion. From its anterior part the three divisions of the fifth nerve are given off: the ophthalmic (which contains the sensory fibres from the cornea and the eye in general), the maxillary and the mandibular nerves. Syn. semilunar ganglion; trigeminal ganglion. See herpes zoster ophthalmicus. lenticular ganglion; ophthalmic ganglion See ciliary ganglion. semilunar g . See gasserian ganglion. superior cervical ganglion One of the uppermost and largest ganglion in the two chains of sympathetic ganglia lying alongside the vertebral column. It is located just below the base of the skull between the internal carotid artery and the internal jugular vein. It gives rise to the internal carotid nerve, which forms the internal carotid plexus. trigeminal ganglion See gasserian ganglion. Originally, any group of nerve cell bodies in the central or peripheral nervous system; currently, an aggregation of nerve cell bodies located in the peripheral nervous system. n/n.pl an accumulation of neuron cell bodies outside the central nervous system. pyramidal motor system, which goes directly from the cerebral cortex to the lower motor neuron. Disease associated with the basal ganglia is manifested by three principal motor abnormalities: disturbance of muscle tone, derangement of movement, and loss of associated or automatic movement. n a parasympathetic nerve ganglion in the posterior part of the orbit. The ciliary ganglion receives preganglionic fibers from the region of the oculomotor nucleus and sends postganglionic fibers via short ciliary nerves to (1) the constrictor muscle of the iris (constriction of pupil) and (2) circular fibers of the ciliary muscle (accommodation for vision). n a ganglion located medial to the mandibular nerve just below the foramen ovale in the infratemporal fossa. It supplies the sensory and secretory fibers for the parotid gland. Its sensory fibers arise from the facial and glossopharyngeal nerves. n a ganglia located deep in the pterygopalatine fossa that is intimately associated with the maxillary nerve. It lies distal and medial to the maxillary tuberosity. Its fibers supply the oral mucosa of the oropharynx, tonsils, soft and hard palates, and nasal cavity. The mucous and serous secretions of all the oral mucosa of the oropharynx are also mediated by this ganglion. n a ganglion located on the medial side of the mandible between the lingual nerve and the submandibular duct. The submandibular ganglion is distributed to the sublingual and submandibular glands. The sensory fibers arise from the lingual branch of the trigeminal nerve; i.e., the chorda tympani of the facial nerve. n a cluster of nervous tissue located on the root of the fifth cranial (trigeminal) nerve. pl. ganglia, ganglions [Gr.] a knot or knotlike mass; a general term to designate a group of nerve cell bodies, located outside the central nervous system. Occasionally applied to certain nuclear groups within the brain or spinal cord, e.g. basal ganglia. small sympathetic ganglia supplying nerve fibers to the kidneys. aggregations of cell bodies of neurons of the autonomic nervous system; the parasympathetic and the sympathetic ganglia combined. subcortical masses of gray matter embedded in each cerebral hemisphere, comprising the corpus striatum (caudate and lentiform nuclei), amygdaloid body and claustrum. Other structures have also been considered to be part of the basal ganglia. Called also basal nuclei. ganglia of the superficial cardiac plexus found close to the aortic arch. two large sympathetic ganglia, found on either side of the celiac artery, supplying nerve fibers to the viscera supplied by that artery; sensory and parasympathetic fibers also pass through the ganglia. parasympathetic ganglia in the head, consisting of the ciliary, otic, pterygopalatine and submandibular ganglia. those associated with the cranial and spinal nerves. 1. any of the three ganglia (cranial, middle and caudal) of the sympathetic trunk found near the base of the skull and inside the thoracic inlet. a ganglion on the sympathetic trunk formed by a union of the caudal cervical and one or more thoracic ganglia. Called also stellate ganglion. a parasympathetic ganglion in the posterior part of the orbit supplied by the oculomotor nerve. an enlargement on a nerve that does not have a true ganglionic structure. the sensory ganglion of the facial nerve, on the geniculum of the facial nerve. the single ganglion commonly found where the sympathetic trunks of the two sides unite. 1. the proximal ganglion of the vagus nerve. 2. the proximal (superior) ganglion of the glossopharyngeal nerve. the ganglia on the lumbar part of the sympathetic trunk. a parasympathetic ganglion next to the medial surface of the mandibular nerve, just ventral to the foramen ovale. Its postganglionic fibers supply the parotid gland. Called also Arnold's ganglion. aggregations of cell bodies of cholinergic neurons of the parasympathetic nervous system; these ganglia are located near to or within the wall of the organs being innervated. the distal ganglion of the glossopharyngeal nerve. a parasympathetic ganglion in a fossa in the sphenoid bone, formed by postganglionic cell bodies that synapse with preganglionic fibers from the facial nerve via the nerve of the pterygopalatine canal. Called also sphenopalatine ganglion. those of the sacral part of the sympathetic trunk. any of the ganglia of the peripheral nervous system that transmit sensory impulses; also, the collective masses of nerve cell bodies in the brain subserving sensory functions. a cystic tumor in a tendon sheath. ganglia on the dorsal root of each spinal nerve. the ganglion on the cochlear nerve, located within the modiolus, sending fibers peripherally to the organ of Corti and centrally to the cochlear nuclei of the brainstem. Called also Corti's ganglion. aggregations of cell bodies of adrenergic neurons of the sympathetic nervous system; these ganglia are arranged in chainlike fashion on either side of the spinal cord. the ganglia on the thoracic portion of the sympathetic trunk. a ganglion on the sensory root of the fifth cranial nerve. Called also gasserian ganglion and semilunar ganglion. an enlargement on the tympanic branch of the glossopharyngeal nerve. the sensory ganglion of the vestibular part of the eighth cranial nerve, located in the dorsal part of the lateral end of the internal acoustic meatus. 8) However, the treatment methods for ganglion cysts have proved inconsistent and variable. The purpose of this retrospective study was to analyze a series of 12 cases of surgically treated intra-articular ganglion cysts of the knee in order to better understand and improve the treatment of this disorder. Although these types of tumors are extremely rare, diagnostic criteria and differential diagnosis are necessary, as is specifying the type of ganglion cell neoplasm (JOSHI, 2000; RIVARD et ah, 2016). Prior to injection, the exosomes were fluorescently labelled allowing the researchers to track the delivery of the exosome cargo into the retinal ganglion cells. 6) It has been reported that surgical treatment of ulnar intraneural ganglion can be successful after more than 14 months of symptoms. A ganglion cyst is a benign mass with a collagenous fibrous capsule surrounding high-viscosity mucinous fluid. 19] Previous data in literature have suggested that all DRG cell bodies express NF-M and NF-H, while only NF-L defines a distinct class of rat sensory ganglion cells, and in particular, only the large-light cell bodies were seen NF-L positive. Patients with clinical diagnosis of dorsal wrist ganglion and not treated before for the same were included in the study. Since there's image processing at every cellular layer in the eye, and the ganglion cells are deeper than the rods and therefore receive fewer photons, it isn't clear exactly what visual granularity can be achieved here. Ganglion cysts are dense, encapsulated structures filled with clear viscous fluid that often arise adjacent to tendon sheaths or joint capsules, most commonly over the dorsum of the hand. a) In nearly 80% of the general population, the stellate ganglion forms from the fusion of the inferior cervical ganglion with the first thoracic ganglion.